Of Usury, from Brant's Stultifera Navis (the Ship of Fools); woodcut attributed to Albrecht Dürer. 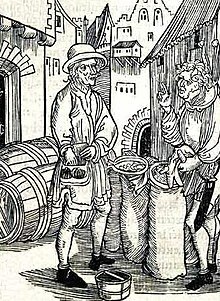 Usury from Medieval Latin usuria, "interest", or from Latin usura, "interest") originally was the charging of interest on loans; this included charging a fee for the use of money, such as at a bureau de change. In places where interest became acceptable, usury was interest above the rate allowed by law. Today, usury commonly is the charging of unreasonable or relatively high rates of interest. The term is largely derived from Christian religious principles; Riba is the corresponding Arabic term and ribbit is the Hebrew word. The pivotal change in the English-speaking world seems to have come with the permission to charge interest on lent money: particularly the 1545 act "An Acte Agaynst Usurie" (37 H.viii 9) of King Henry VIII of England. The Qur'an (القرآن), Sura 2:275 (The Cow, سورة البقرة), See also: Islamic banking. Hermann Adler, quoted in Joseph H. Hertz, The Pentateuch and Haftorahs (One-volume edition), p. 849. He who lives by usury in this world shall not live in the world to come. Thomas Fuller, Gnomologia (1732), No. 1689. George Herbert, Jacula Prudentum (1640). Gotthold Ephraim Lessing, Nathan the Wise (1779), Act II, scene II. Jesus, from the Sermon on the Mount, Luke 6:34–35 NIV. Usury lives in the pores of production, as it were, just as the gods of Epicurus lived in the space between the worlds. Karl Marx, Capital, Volume III (1894), Chapter XXXVI, Pre-Capitalist Relationships, p. 598. Karl Marx, Capital, Volume III (1894), Chapter XXXVI, Pre-Capitalist Relationships, p. 607. Jewish usury was prohibited at common law, but no other. Hale, C.B., Anonymous (1665), Hard. 420; reported in James William Norton-Kyshe, Dictionary of Legal Quotations (1904), p. 244. The source notes: "according to Lord Coke, all usury is unlawful.—2 Inst. 89 ; 3 Inst. 151". The true spirit of usury lies in taking an unjust and unreasonable advantage of their fellow creatures. Burnett, J., Earl of Chesterfield v. Janssen (1750), 2 Ves. Sen. 141; reported in James William Norton-Kyshe, Dictionary of Legal Quotations (1904), p. 244. William Shakespeare, The Sonnets , IV. Since they [usurers] sell nothing other than the expectation of money, that is to say, time, they sell days and nights. But the day is the time of clarity, and the night the time of repose. It is, therefore, not just for them to receive eternal light and eternal rest. Frequently nowadays the use of highly sophisticated computers involves the 'selling' of time on them. In the Middle Ages this practice would have been severely frowned upon by the Church, for one of its main objections to the practice of usury was that it contravened natural law by 'selling time', and in its view time necessarily belongs to all creatures. Bartley: Why dost laugh, Frank? Ilford. To see that we and usurers live by the fall of young heirs, as swine by the dropping of acorns. George Wilkins, The Miseries of Inforst Mariage (1607), Act III.